With the launch of new Nintendo Switch we have a new Zelda game, The Legend of Zelda Breath of the Wild. This new Zelda game is getting tons of killer reviews around the world. The main reason for these awesome reviews is the modern conventions and style used in Breath of the Wild. The game offers a ton of exploration, adventures and challenging quests. You can explore this new fantasy world for hours and still manage to find some awesome stuff hidden in the far corners of the map. The game features plenty of weapons, monsters, creatures, outfits, quests and mysteries. For explorer minds out there, this Zelda game will definitely be a treat. There are various creatures in the world that you can mount. One of these creatures is a Stalhorse. 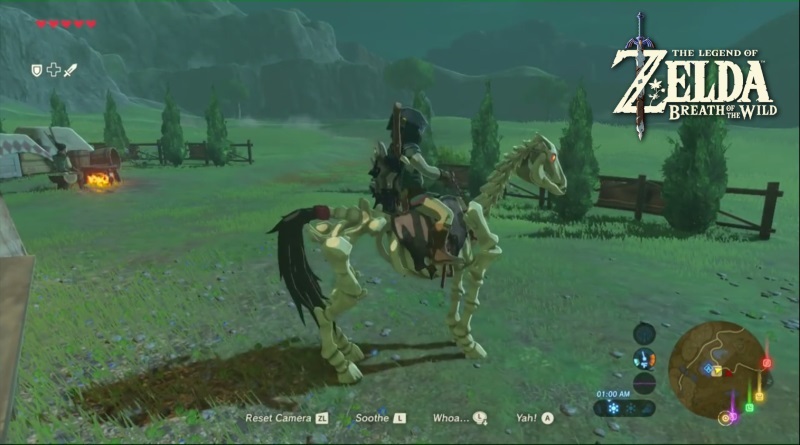 It’s a Skeleton Horse that you can mount and ride in The Legend of Zelda Breath of the Wild. These Skeleton Horses look incredibly awesome and paint a picture of Grim Horse. But stats wise these Stalhorse are dull during combat as these are not as fast as you think. There are plenty of locations to find Skeleton Horse (Stalhorse) in the game. In this article How to find Skeleton Horse in The Legend of Zelda Breath of the Wild we will help you find a Skeleton Horse. You can easily find Skeleton Horses in Akkala Highlands or where you find Bokoblins. As these creatures are from undead category, you have to wait for these creatures to spawn at night. To mount Skeleton Horses just kill the mounted undead bokbolin and then the horse will be yours to ride. When you ride these undead creatures (Skeleton Horse) every Hylian NPC will be terrified and react accordingly. You can see changes in their behavior while talking to them as their dialogues will change when they see an undead creature. Aside from low stats, another let down is that you cannot register your Skeleton Horse with any of the Stables available in the game. The owners of the stables are terrified and they think that your undead horses will eat other horses in the stable. But the final heartbreak will happen at dawn when your skeleton horse will die at 5:00 in the morning. And there’s no need to revive it because you cannot resurrect it from the Horse Fairy.